Daimler, whose primary listing is in Frankfurt, says U.S. trading accounted for less than 5 percent of total volume in the past 12 months. BERLIN (Bloomberg) -- Daimler AG, the world's second- largest maker of luxury cars after BMW AG, plans to end its stock listing in New York, citing low trading volumes. 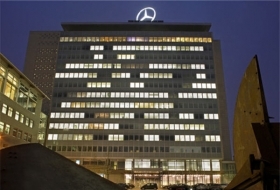 Daimler wrote to the New York Stock Exchange today about its plan to delist the stock and the 8.5 percent notes due Jan. 18, 2031 issued by Daimler Finance North America LLC, the German automaker said in a statement today. Daimler, whose primary listing is in Frankfurt, said U.S. trading accounted for less than 5 percent of total volume in the past 12 months. Daimler fell 29.5 cents, or 0.7 percent, to 41.08 euros as of 2:39 p.m. in Frankfurt. The shares closed at the equivalent of 40.83 euros in New York trading yesterday.